Our Mont Blanc ski serving tray is pure nostalgia with its old-fashioned skis and poles lined up against a wall on a sunny winter day makes us think of ski trails, cozy ski lodges and piping hot cups of cocoa. 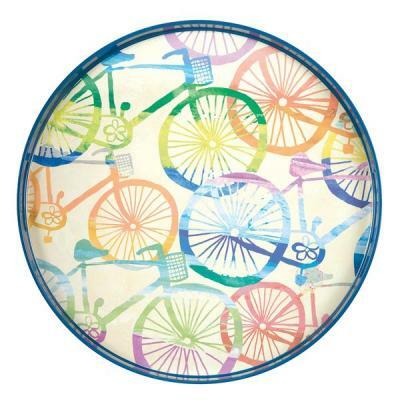 A wonderful gift or a great coffee-table display for a ski cabin or mountain house! SKU: 57-7022-2. Categories: Baskets & Trays, Gifts, Vintage & Reclaimed, Winter. 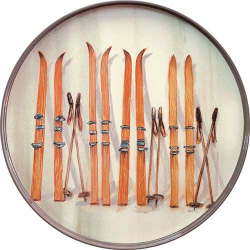 The nostalgic hand-painted image of wooden skis and poles beautifully reproduced on this tray makes us think of cozy ski lodges and piping hot cups of cocoa. 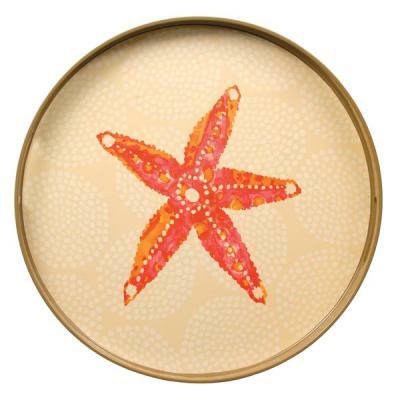 Our unique round trays are made from a durable, easy-to-maintain poly-ceramic composite. This advanced material gives you the look, feel and weight of the fine ceramics of yesteryear while also providing the ease of care you have come to expect from modern plastic products. Perfectly suited for serving drinks at a holiday party or bringing mugs of hot chocolate to snowball fighters, this serving tray also makes a lovely coffee-table display, especially for a ski cabin or mountain house!